Law reform is a process by which the laws, such as family laws, are modernized and shaped over time to better reflect the important social values of the modern society. Law reform improves access to justice, eliminate defects in the laws and suggest effective methods for administering the law and dispensing justice. 1 There are a few major agencies that influence on reforming the law, these are the Law Reform Commissions, the Parliament and its Committees, the media, and the non-government organisations. Major formal means that investigate and recommend changes for law reform are through the operation of law reform commissions. The two main agencies of law reform in Australia are the Commonwealth and State Law Reform Commissions. The law reform agencies do not change the law but rather investigate legal discrepancies and make recommendations to the Parliament, who has the authority for incorporating law amendments. These agencies of reform were also created to ensure independence of governments, political parties, and lobby groups; to ensure high quality of research of the development of well respected bodies, and; build up specific expertise and authority in the society. 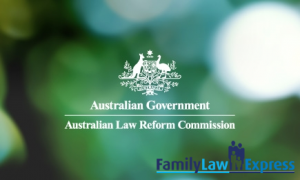 Australian Law Reform Commission (ALRC): The ALRC is a federal agency that conducts inquiries into areas of law, such as Family law, at the request of the Attorney-General. It is operating under the Australian Law Reform Commission Act 1996 (CTH) and the Financial Management and Accountability Act 1997. The ALRC’s report “For the Sake of Kids: Complex Contact Cases and the Family Court 1995” was a vital reason for the 1995 amendment of the Family Law Act 1975. This is called the Family Law Reform Act 1995 (CTH). Both parents were given responsibility for the care and control of their children involving provisions such as education, discipline and medical treatment, this was seen as effective to both parents. These provisions were made clear in the cases of Capodici v Capodici, In the Marriage of McEarney and In the Marriage of Chandler. In October 2010, the ALRC and NSWLRC completed an inquiry into Family Law and Family Violence. The report highlighted the need to enhance collaboration between the Commonwealth family law system and the state and territory child protection systems. It further added recommendations to the existing law and expanding the evidence base that is used to examine the problems alleging family violence and child abuse. 5 Both Commonwealth and State Law Reform Commissions are seeking to better change existing laws in order to reflect the modern society. The Parliament or the lawmaking body of the Australian legal system has the legislative function to amend existing laws. The Parliament reforms the law by passing legislation, called statute laws. It seeks to reform the laws in order to better reflect the policies of the Government. The courts, on the other hand, interpret the laws made by the Parliament and through judicial decisions the Courts can shape the law and reform it. Under the common law rule, judges can reform the law by setting precedent decisions that can be applied to subsequent cases of similar issues. The Family Court of Australia also publicizes media releases to update the public in relation to any family law matters. In 2004 Chief Justice Bryant welcomed the Government’s proposed changes to the Family Law 8 such is a mechanism for law reformation. The House of Representatives is one of the houses of Australia’s Commonwealth Parliament with the role of determining the government, debates and passes laws, watches over government administration and expenditure, and provides forum for public debate on issues of national importance9 thus, an agency of law reformation. There are a number of statutory bodies that can advise and inform the parliament of areas that require law reform. They include the Family Law Council (a Federal body). What Resources Are Available to a Parent Whose Child has been Abducted?